Sterling Hayden, Coleen Gray, Vince Edwards, Jay C. Flippen, Ted de Corsia, Marie Windsor, Elisha Cook Jr. While in many ways 1956’s The Killing seems to be one of Stanley Kubrick's more conventional pictures, the Big K did offer one unusual technique: a lack of linear chronology that features many scenes repeated from the points of view of different characters. While this method didn't catch on with many filmmakers at the time, I'd guess Quentin Tarantino saw The Killing, because he uses exactly the same gimmick in pretty much all of his movies; think of the mall scene in Jackie Brown, for example. I suppose it's a measure of Kubrick's artistry that this technique – which is still unusual many decades later - remains in use and seems clever and daring to this day. So many movies feature only one perspective, so to depict the same event from a number of points of view is quite invigorating, and while Kubrick's early use of this method doesn't work as flawlessly as it does in Tarantino's films, it nonetheless makes for a very interesting change of pace. Overall, The Killing offers a fairly compelling but not terribly original story. It's the same old saw: a bunch of losers try for the big score and fail. The film seems more melodramatic than those we'd later see from Kubrick. He was one of the most objective filmmakers ever and rarely imposed his point of view on the audience; in this instances when he did – Full Metal Jacket, for example - the movie suffered as a result. In this instance, it's not so much an example of Kubrick imposing his own perspective and interpretation on the audience as it is simply a fairly conventional, uninspired case of storytelling. The movie's interesting, to be sure, and definitely held my attention. There just wasn't much to make it stand out from the crowd other than the alteration of linear progression. While competently acted, the characters rarely rise above the level of fairly stereotypical, and the frequent use of a heavy-handed narrator bogs down the film to a great degree; much of this seemed unnecessary and also made the movie appear more ponderous than it should. The Killing provides a pretty provocative experience, ultimately, but not one without flaws. It's a movie that I enjoyed and found interesting but definitely not one of Kubrick's best, if just because it seems so ordinary compared to his later works. 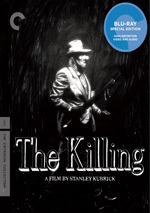 The Killing appears in an aspect ratio of approximately 1.66:1 on this Blu-Ray Disc. Criterion’s older black and white transfers have been good to great, and Killing followed that admirable trend. Sharpness looked terrific. Only the slightest smidgen of softness ever interfered, and those instances virtually always related to the source material; otherwise the image was precise and well-defined. I saw no signs of jagged edges or shimmering, and edge haloes were absent. Print flaws failed to appear. Grain could be somewhat heavy, but that was connected to the original photography and looked perfectly natural for a gritty old movie like this. Blacks came across as deep and rich, while shadows seemed superb. The film opted for quite a few low-light interiors, and these demonstrated surprisingly solid clarity and definition. I doubt Killing looked this good when it ran theatrically; this became a simply gorgeous transfer. While not nearly as impressive, the film’s monaural audio was perfectly fine for its age. Speech worked well enough. The dialogue lacked notable edginess and remained intelligible and relatively warm along the way. Music could be a little bright but appeared reasonably full, and effects fared the same way. Louder elements tended to be a tad distorted, but most effects were acceptable to good. The track didn’t show any source defects like noise or popping. Nothing here excelled, but this was a solid “B-“ mix given its era. How did the picture and sound of this Blu-Ray compare with those of the ? Both worked better, especially in terms of visuals. The Blu-ray’s audio seemed a bit cleaner and clearer than the DVD’s material, but it didn’t blow away its predecessor. That wasn’t the case for the visuals, though. Though I thought the DVD looked fine, it didn’t remotely compare to the glorious transfer found here. This wasn’t a case where the Blu-ray worked better than the DVD just because of extra resolution; it combined a superior transfer with Blu-ray’s additional capabilities to become a huge upgrade over the old DVD. We get a mix of extras here. 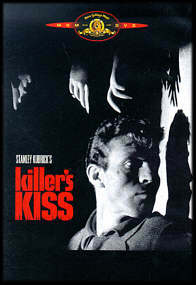 The primary attraction comes from 1955’s The Killer’s Kiss, Stanley Kubrick’s second feature film. For my full take on the film, please go to my original review. To summarize, I didn't dislike Killer's Kiss but I thought it seemed bland and unremarkable, terms the rarely describe the work of Stanley Kubrick. Although it only lasts 67 minutes, it actually felt longer, and that ain't a good thing. In terms of transfer quality, the film looked fine. It wasn’t up to the high standards of The Killing, mainly because it could be a little soft and murky at times. Audio was also mediocre at best, as the lines tended to be poorly dubbed and seem artificial; I heard a fair amount of distortion from effects as well. However, I think Criterion did about as much as they could with the source material. Essentially a cheap glorified student film, I suspect that the issues I saw/heard related to the original film and weren’t a by-product of transfer deficiencies. While not as impressive as the presentation of The Killing, I thought Killer’s Kiss looked/sounded more than acceptable – and both demonstrated notable improvements over the problematic DVD linked earlier. Two more supplements accompany Killer’s Kiss. In addition to the film’s trailer, we get a Video Appreciation of the film. It goes for nine minutes, 14 seconds as critic Geoffrey O’Brien chats about aspects of the flick, its influence on other works and its place in Kubrick’s catalog. Nothing he says makes me care for Kiss, but I’m happy to get some thoughts about it that broaden my understanding of it. The remaining extras look at The Killing itself. Along with the movie’s trailer, we discover an Interview with Producer James B. Harris. This 2010 session runs 21 minutes, seven seconds as Harris discusses his relationship with Kubrick, the development of Killing and aspects of its production, cast and performances, the movie’s reception and his career after its release. I’d like a little more about The Killing itself, but we still get a nice array of comments here. From 1984, an Interview with Actor Sterling Hayden goes for 23 minutes, 40 seconds. He covers how he got into acting and a mix of thoughts about his life and career. Hayden only briefly chats about The Killing, so don’t expect to learn much about the film. He does seem blunt and informative, so the interview’s well worth a look, even though Hayden’s verbal tic in which he often interjects “huh?” as part of his answers gets annoying. Finally, we find Polito on Thompson. This 18-minute, 42-second piece delivers poet/author Robert Polito’s thoughts about novelist Jim Thompson. He goes over Thompson’s relationship with Kubrick and their collaboration on Killing, the adaptation of the source novel, and other aspects of his career. Polito remains on point from start to finish and makes this an engaging chat. Like all Criterion releases, Killing comes with a booklet. This 22-page piece includes an essay from Harvard Film Archive director Haden Guest and an interview with actor Marie Windsor. This isn’t one of the best Criterion booklets, but it still offers some good information. No one seems likely to perceive The Killing as great – or even particularly good – Kubrick. However, the movie shows some strong elements and remains consistently interesting. The Blu-ray boasts surprisingly excellent visuals along with more than acceptable audio and a collection of supplements highlighted by Killer’s Kiss, another Kubrick flick. This one becomes a must-have for Kubrick buffs, as they’re unlikely to ever find a better presentation of the two films found on the Blu-ray.